This chapter explores the JavaFX Canvas API, featuring code examples that you can compile and run. Use the links on the Source Code for the Graphics Tutorials page to download the examples as NetBeans IDE projects. 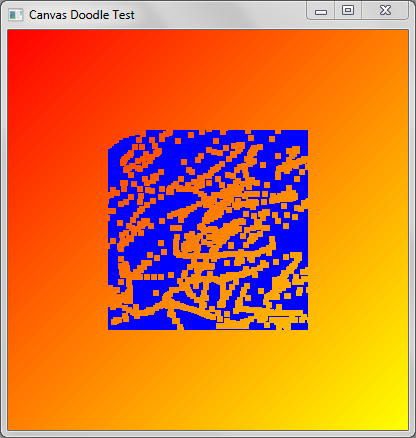 The JavaFX Canvas API provides a custom texture that you can write to. 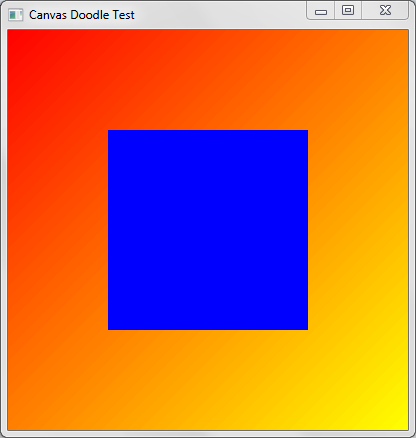 It is defined by classes Canvas and GraphicsContext in the javafx.scene.canvas package. Using this API involves creating a Canvas object, obtaining its GraphicsContext, and invoking drawing operations to render your custom shapes on screen. Because the Canvas is a Node subclass, it can be used in the JavaFX scene graph. The BasicOpsTest project (shown in Figure 9-1) creates a Canvas, obtains its GraphicsContext, and draws some basic shapes to it. 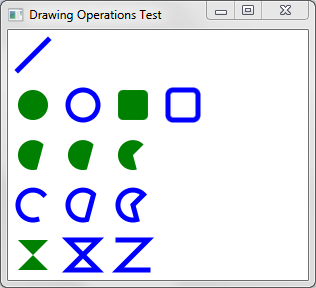 Lines, ovals, round rectangles, arcs, and polygons are all possible using methods of the GraphicsContext class. Download the BasicOpsTest.zip file for the complete BasicOpsTest NetBeans project. Description of "Figure 9-1 Drawing Shapes on a Canvas"
As shown in Example 9-1, the Canvas is instantiated with a width of 300 and a height of 250. 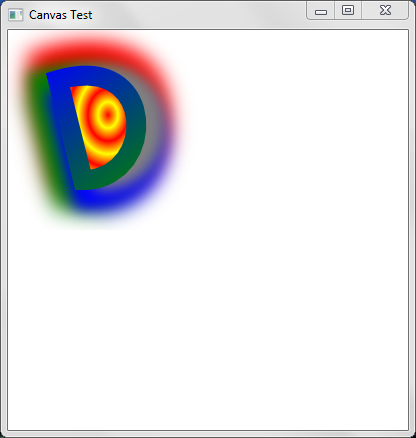 Its GraphicsContext is then obtained with a call to canvas.getGraphicsContext2D(). After that, a number of basic drawing operations are carried out by invoking methods such as strokeLine, fillOval, strokeArc, and fillPolygon. Description of "Figure 9-2 Drawing Shapes, Gradients, and Shadows"
The code for this example is organized so that each drawing operation is carried out in its own private method. This allows you to test out different features by simply invoking (or commenting out) the methods of interest. Just keep in mind that in terms of learning the Canvas API, the code to focus on is the underlying calls to the Canvas or GraphicsContext objects. There are five main parts to this pattern. First, the position of the Canvas is set at coordinates(0,0). This is done by invoking the code in Example 9-2, which applies a translation transformation to the underlying Canvas object. You can pass in other values as parameters to move the Canvas to a new location. The values that you pass in will be forwarded to the setTranslateX and setTranslateY methods, and the Canvas will move accordingly. Next, the primary shape (which looks like the capital letter "D") is drawn on screen. This is done with a bezier curve, invoked through the bezierCurveTo method of the GraphicsContecxt object. You can experiment with this shape by changing the parameter values. The bezierCurveTo will stretch and pull the shape as you do. After that, a red and yellow RadialGradient provides the circular pattern that appears in the background. Here, the setFill method of the GraphicsContext accepts a RadialGradient object as its parameter. Again, you can experiment with different values, or pass in different colors as you prefer. This code sets the stroke of the GraphicsContext to use the LinearGradient, then renders the pattern with gc.stroke(). And finally, the multi-colored drop shadow is provided invoking applyEffect on the GraphicContext object. As shown in Example 9-6, this effect is applied by creating a DropShadow object with a specified color, which gets passed to the applyEffect method of the GraphicsContext object. Description of "Figure 9-3 Interacting with the User"
You have already seen how to create basic shapes and gradients, so the code in Example 9-7 focuses only on the portions responsible for interacting with the user. Example 9-7 defines a reset method that fills the entire rectangle with its default blue color. But the most interesting code appears in the start method, which is overridden to interact with the user. The first commented section adds an event handler to process MouseEvent objects as the user drags the mouse. With each drag, the clearRect method of the GraphicsContext object is invoked, passing in the current mouse coordinates, plus the size of the area to clear away. As this takes place, the background gradient will show through, as seen in Figure 9-4. Description of "Figure 9-4 Clearing Away the Rectangle"
The remaining code simply counts the number of clicks, and resets the blue square to its original state if the user double-clicks the mouse. Description of "Figure 9-5 Creating a Simple Layer System"
The GUI for this demo uses a BorderPane to manage its components. A ChoiceBox is added to the top, and the two Canvas objects are added to a Panel which is then added to the center of the screen. User interaction is accomplished by adding an event handler directly to each layer. Clicking on the Canvas will generate a MouseEvent, which when received, will draw a circle at the current mouse location. 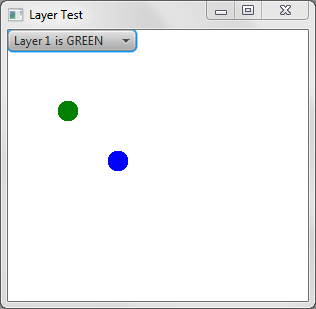 Because both layers are placed directly on top of each other, only the topmost Canvas will process the mouse clicks. To move a specific layer to the front of the stack, simply select it from the ChoiceBox component at the top of the screen. As shown in Example 9-10, a ChangleListener is registered on the ChoiceBox, and brings the selected layer to the foreground by invoking toFront() on the appropriate Canvas. 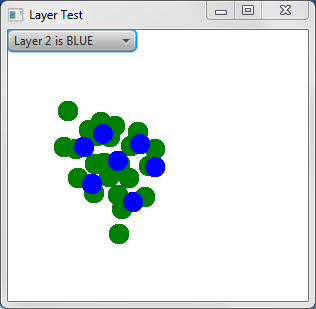 Layer selection will become even more apparent as you switch layers after adding lots of blue and green circles. You will be able to tell (from looking at the circle edges) which layer has been moved to the front. Figure 9-6 and Figure 9-7 show what this looks like. Description of "Figure 9-6 Selecting Layer 1"
Description of "Figure 9-7 Selecting Layer 2"
The ability to select layers is common in software applications, such as image manipulation programs. And because each Canvas object is a Node, you are free to apply all the standard transformations and visual effects that you would on other components.